Boulder International Film Festival: PREVIEW: "Granito: How to Nail a Dictator"
Friday, Feb. 17, 10 a.m. Slowly, piece by piece, person by person, like grains of sand (granitos de arena) we see how an international criminal case is built. The struggle begun in those days and so violently crushed has continued with each person doing a little part from then until now. As one of the characters says, opening little cracks and pushing and pushing until they open up. Everyone has a role to play and it does seem almost like divine intervention (the film website credits a Mayan god) that they all can come together and that evidence emerges from unexpected sources. From the old days, there is Yates and her footage, a journalist who helped her get contact with the guerrillas who was working in Guatemala at the time who is now an international lawyer, one of the commanders of the Guerrilla Army of the Poor who lived underground in Guatemala City for 17 years, and a witness whose highland village was massacred when he was 11 years old. Coming into the story now are the Spanish lawyers, a forensic archivist, a forensic archaeologist whose family left Guatemala under death threats in 1980, and a daughter of the one of the disappeared who has become a lawyer. One of the most interesting aspects of the movie especially for film lovers is Yates' coming to terms with the fact that witnessing and telling the story was not enough. In 1982, she and cinematographer Newton Thomas Sigel risked their lives getting footage that revealed the true story of what was happening in Guatemala at the time. We are reminded in the days before digital how difficult it was to get film footage under repressive regimes. There is no way she should have gotten the footage that she got from the guerrillas and the military, and yet she did, and she brought it together into a film that had as much success as one could hope for. When the Mountains Tremble showed at the first Sundance Film Festival, the narrator Rigoberta Menchú received the Nobel Peace Prize, the film showed broadly internationally and in 40 cities in the United States and won many awards. 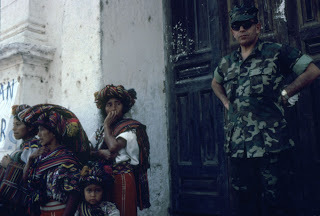 And yet the massacres continued with 200,000 thought dead, the U.S. continued to support the Guatemalan dictators and other repressive dictatorships in Central America, the perpetrators have continued to go unpunished. Journalist turned lawyer Naomi Roht-Arriaza expresses similar disillusionment at the time, when she felt she was getting a story out and yet it was doing absolutely no good against the violence of the state apparatus. Only now are the pieces starting to come together, bringing together different fields from law, to forensic science, to digitizing archives, to begin to bring justice in the region. On January 26th of this year, after thirty years of impunity, General Ríos Montt, who reveals himself in an interview with Yates done in 1982 as the head of the Guatemalan military, was placed under house arrest for 11 massacres against the Mayan Ixil population. This self-reflection makes Granito a perfect film for BIFF's Call2Action where it has been paired with Philanthropiece and Reading Village, both of whom work in development in highland Guatemala, to direct viewers to action-oriented responses. Granito will be showing Friday, February 17th at 10am at the Boulder Theater followed by a Q&A in the theater and a public discussion in the Call2Action tent on the Pearl Street Mall in front of the courthouse.